At the far southern end of New Caledonia is a region of streams and small lakes called Plaine des Lacs. 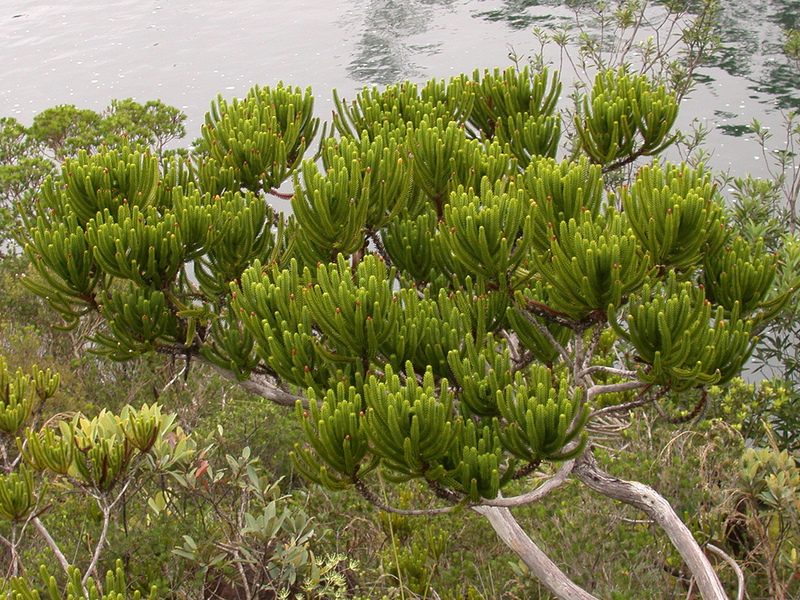 Most strand vegetation in New Caledonia is populated by Indo-Pacific plant species. Not so for the Plaine des Lacs region, where ultramafic soils (metalliferous soil low in silica and nutrients) reach the water, and all the wetland species are New Caledonian endemics. Chutes de la Madeleine Reserve, southern New Caledonia. Found only on the banks of the river lakes in the south of Grande Terre. Endangered. Photo Tim Waters. The Plaine des Lacs and surrounding streams and lakes are especially rich in conifers from the Podocarpaceae family. 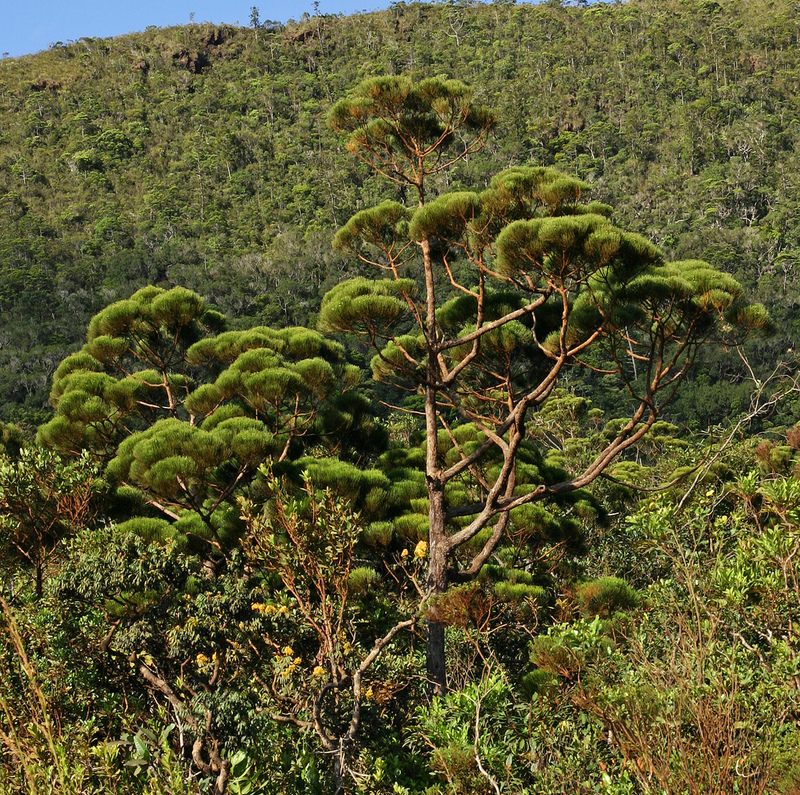 The Podocarpus genus is comprised of 82 species, which puts the genus just behind its northern-hemisphere counterpart, Pinus, which contains 97 species. 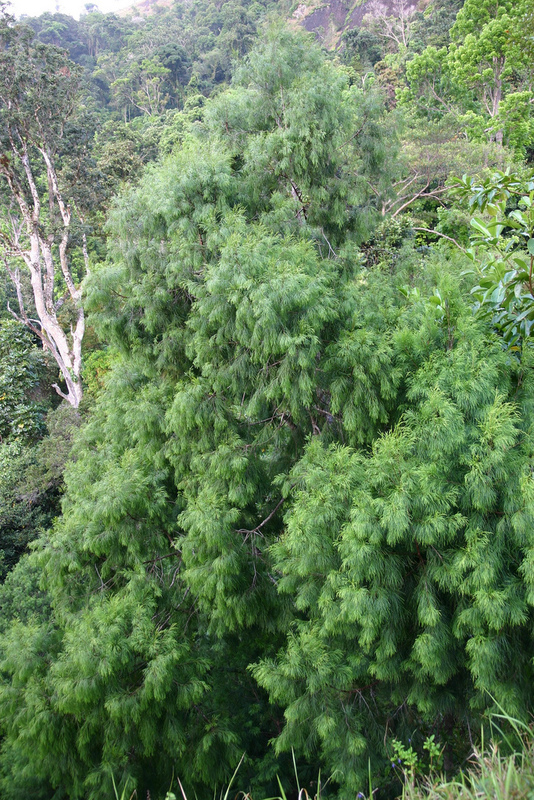 In fact, one of the world’s rarest conifers is a Podocarpus that grows only here, the cattail rimu or Dacrydium guillauminii. * This wetland specialist grows with its feet in the water at stream margins and lake-shores. Neocallitropsis pancheri (Cupressaceae). Photo Tim Waters. Another rare conifer endemic to New Caledonia is a member of the Cupressaceae or cypress family. The chandelier cypress or Neocallitropsis pancheri is the sole living species in its is genus. While it grows in various local ecosystems, including rainforests and shrubland, the chandelier cypress prefers river valleys. Neocallitropsis pancheri was exploited in early part of the last century for essential oil used in perfume. A plant that is reminiscent of cypress, specifically pond cypress, grows exclusively in the Plaine des Lacs area. New Caledonia corkwood or Retrophyllum minor (Podocarpaceae) grows in inundated soils or standing water at the edges of lakes and slow-moving streams. And like the bald and the pond cypress, it has a swollen trunk. Unlike those species (to which Retrophyllum minor is unrelated), it is quite diminutive, being only a dwarf tree or shrub. In fact, all other trees in the Retrophyllum genus are rainforest giants. The common name refers to the plant’s wetland adaptation: the corky, air-transmitting tissue that swells its trunk. The scientific name means “backward leaf” and refers to a feature unique to its genus. The leaves are arranged in pairs on each side of the twig. However, on one side of the twig the leaves face up, while on the opposite side they face down. 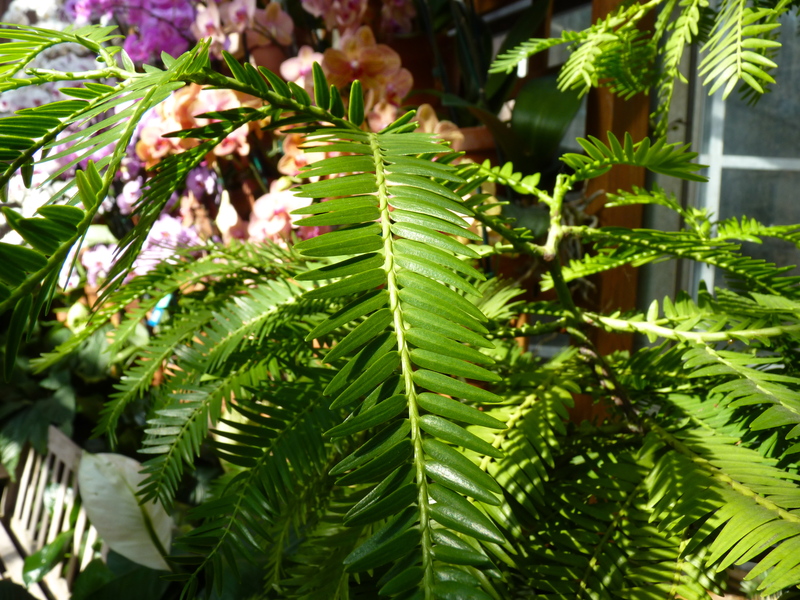 The leaves on the reversed side are actually twisted on their petioles (see photo below). One more genus that bears mentioning is Gymnostoma. 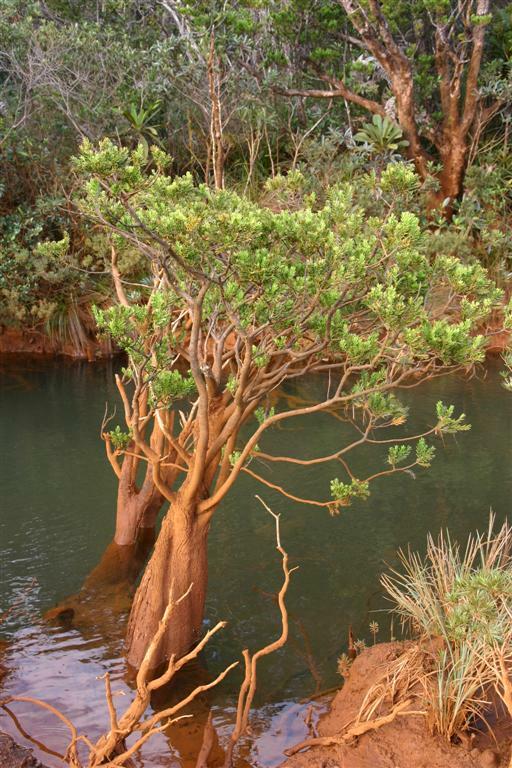 It contains 18 species of trees and shrubs, 8 of which are found only in New Caledonia. Gymnostoma webbianum and Gymnostoma deplancheanum can be found growing in wetland areas. While Gymnostoma trees may look, in certain cases, like some kind of conifer, they are actually flowering plants in the Casaurinaceae family. The plants in this family are actinorhizal, meaning their roots have a symbiotic relationship with bacteria that helps them take up nitrogen. This is especially useful for plants growing in New Caledonia’s famously nutrient-poor ultramafic soils. 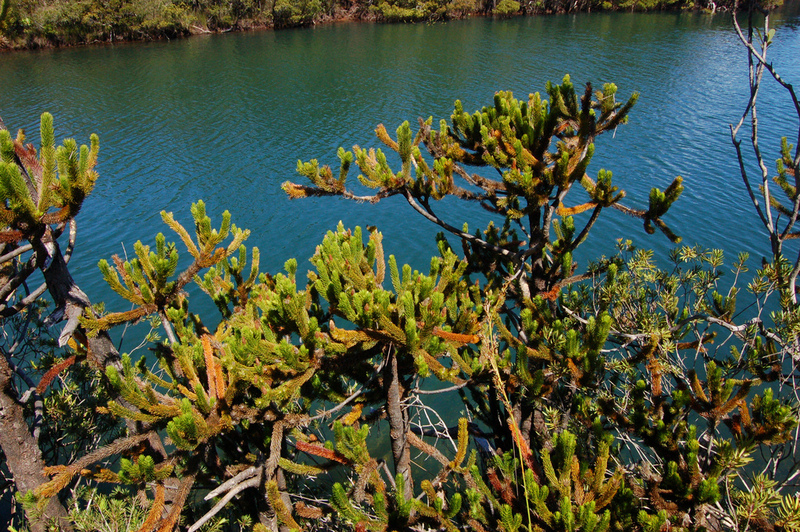 The IRD is studying the symbiotic relationship between New Caledonia’s Casaurina and its associated bacteria, Frankia. The habitat defined by the narrow margins between the land and the rivers, lakes and streams of southern New Caledonia is a very special niche habitat. The unusual conditions created by soil type and hydration has yielded a number of unique species. But living in such an ecologically narrow margin means that these specially adapted species are particularly vulnerable. Dams and the mining operations have altered the water levels. As a consequence, a number of the exceedingly rare species restricted to this habitat have suffered, including Neocallitropsis pancheri and Retrophyllum minor, the latter of which is down to about 2,500 individuals in the wild. Gymnostoma deplancheanum (Casuarinaceae) Photo Chad Husby. * Dacrydium guillauminii is not a part of the Atlanta Botanical Garden’s collection. Institut de recherche pour le développement (IRD). “A common genetic mechanism discovered in nitrogen-fixing plants.” Scientific News Fact Sheet no. 288 February 2008.